It’s amazing how literature is filled with different types of figurative language that many authors and poets use to add depth to their writing. Though we may not have noticed how often these kinds of words and phrases have been used due to how common they have become in both literature and everyday speech, learning about these literary devices can help enhance our reading and writing skills in many ways. You may also see tips poetry writings. One example of a figure of speech that has been frequently used by many writers and speakers is the synecdoche. So in this article, we look into the basic principles of the figurative language by looking into its various types and examples. You may also see alliteration examples in literature. You’ve probably watched a Pirates of the Caribbean film before and heard one of the captains yell, “All hands on deck!” You certainly don’t see any pair of hands running around the ship, but you do notice how the ship’s crew members begin to muster on deck as soon as their captain calls. With that, you come to the conclusion that the expression used by the speaker was meant to represent a whole—that is, the people to whom these hands are a part of. You may also see satire examples. A synecdoche, which is pronounced as si-nek-duh-kee, is a figure of speech in which a part of something is used to represent a whole. It is derived from the Ancient Greek phrases synekdochē and ekdechesthai, which means “to sense” and “to understand.” Many generations of writers have used synecdoche in both poetry and prose to add an even deeper meaning to their words. It is sometimes defined as a form of personification in cases where it takes the place of a human element for a non-human element. Synecdoche is used in many forms of idioms, colloquial expressions, and slang terms as well. And since synecdoche is meant to be figurative, it should never be taken literally. This example uses wheels as a substitute to what the speaker is actually referring to (car). In reality, the speaker is not complimenting the wheels of the vehicle, but the car itself. You may also see apostrophe examples in literature. 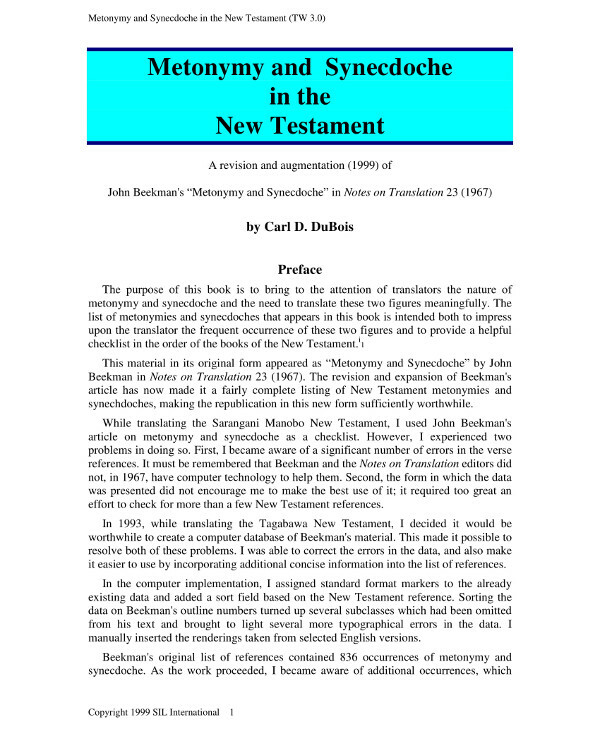 Although synecdoche may be described as a subset of metonymy, the two are not one and the same. Synecdoche is typically confused with metonymy due to how they both use words or phrases to represent something else. However, there are many key characteristics of a synecdoche that allows us to differentiate it from metonymy. You may also see literary analysis examples. For one, synecdoche requires the substituted term being used in the statement to be either a part of the whole or a whole standing in for a part. With metonymy, on the other hand, the term used to describe a thing may be closely related to that particular thing, but not necessarily a part of it. Since both concepts do sound pretty confusing at first, it’s best to see how these figurative terms are used in actual examples. You may also see jargon examples in literature. 1. My grandfather has been in the hospital for four days now due to the flu, but the nurse assures me he is in good hands. Because it’s impossible for a pair of hands to be doing all the work without the initiative made by a person, the phrase in good hands means that the speaker’s grandfather is being taken care of by an entire hospital system, which includes doctors, nurses, and assistants. 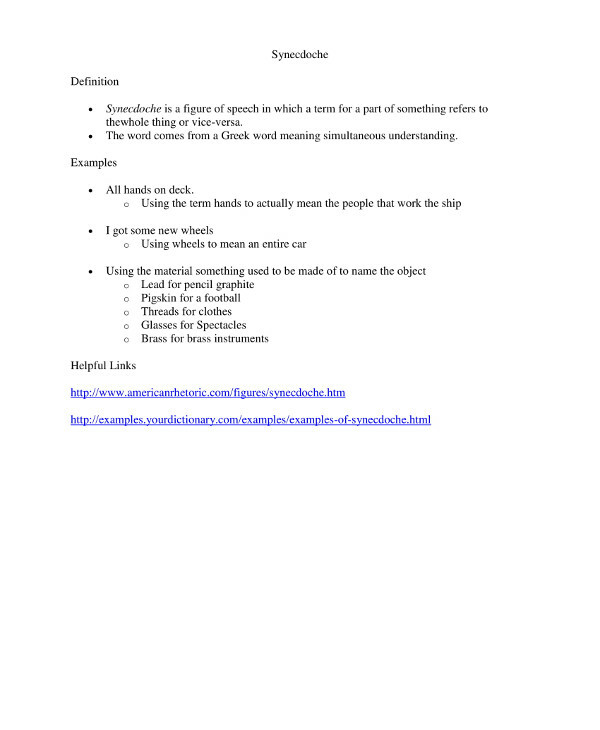 Since the phrase signifies a whole, it can be categorized as a synecdoche example. You may also see onomatopoeia examples in literature. 2. The suits entered the conference room. The suits in this example refer to the actual thing, which are the men themselves. However, we need to point out that these suits are not a part of the men, rather, they are simply related to the men. This classifies the statement as an example of metonymy. You may also see periodic sentence examples. 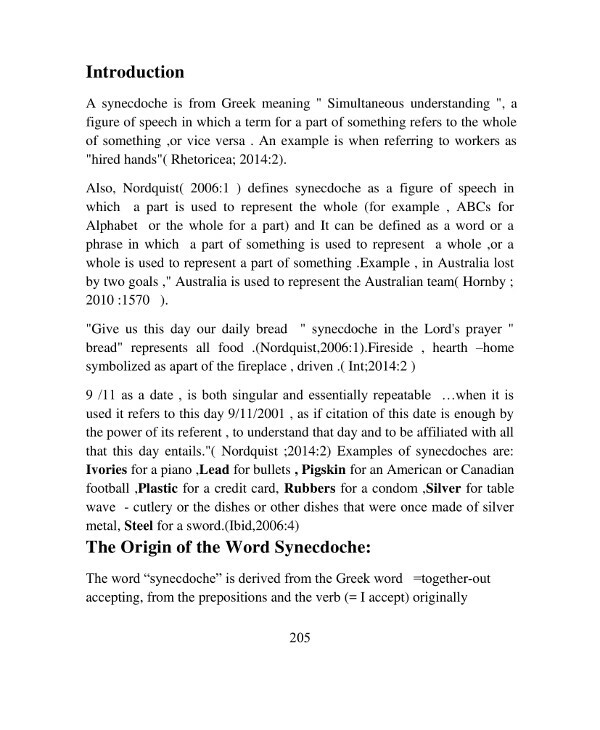 There are several different types of synecdoche in speech and writing. Though this may not matter as long as they are used in proper context, examining the most popular varieties of synecdoche will make it easier for you to recognize this figurative language when used. You may also see allegory examples. It’s very common in synecdoche to use a part of something to represent a whole. In fact, you can find many examples of a part-to-whole synecdoche used in the English language. You may also see balanced sentences. The word sails is a part of a ship that can also be used to refer to a whole ship as an synecdoche example. The word sails can be used to represent food (in general) or money, like how we refer to a hardworking individual as the breadwinner of a family. You may also see irony examples. The phrase “hired hands” may refer to a company’s employees or workers. This form of synecdoche is the exact opposite of the previous type. Here, a whole can be used to represent a part. When we include the phrase “the whole world” or “the world” in a statement, we might not be referring to the entire world in specific, but just a part of it that we’ve encountered. You may also see cumulative sentence examples. The word police may be used to represent one or more officers. You may also see meiosis examples. If someone says that “the hotel” was lovely, then they likely mean the hotel staff or the environment. “Buzzfeed” just posted a new article, which means that a writer or journalist from the company posted it. There are cases when a synecdoche may use a word or phrase as a particular class to express more or less than what it actually means. We sometimes refer to the United States as “America” even when we’re aware that America is made up of several different countries. You may also see reflective essay examples. The brand name “Kleenex” is sometimes used as a synecdoche for all types of facial tissues. “Milk” is commonly used to refer to cow’s milk even when there many classifications of milk such as goat’s milk or almond milk. You may also see informative speech examples. When the material used to create something (or what was used in the past) is used to represent an entire object, it becomes a synecdoche. Cutlery like forks, spoons, and knives are often called “silverware,” even when they aren’t made of silver. The word lead is sometimes used to refer to a bullet. You may also see copyright notice examples. Going for a walk in the “woods” can mean going for a walk in a forest-like setting. 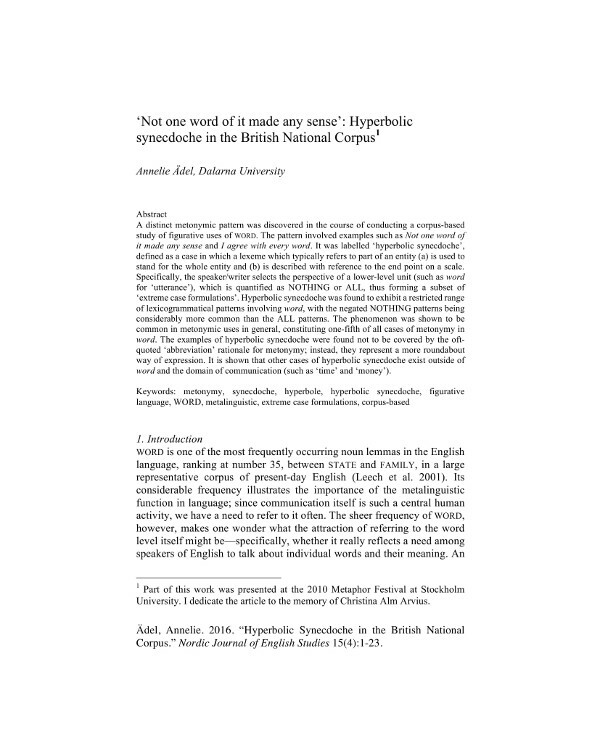 Some literary theorists believe that synecdoche is more than just an ornamental element of literature rather, a primary means of describing and discovering the truth via literature. Along with other figurative languages such as metonymy, metaphor, and words of irony, synecdoche builds a new and creative connection in the way that we, as readers and writers, understand concepts. Whether or not these synecdoches are used intentionally, the connection between two previously unassociated concepts creates a cognitive link for readers to learn from. This is how many modern-day expressions are formed. By exploring how synecdoche is used and applied in literature, we are able to gain a better understanding of the human mind. You may also see summary writing examples. The “ever-fixed mark” in this excerpt from Shakespeare’s poem refers to a lighthouse that was talked about in the given scene. The example above is an excerpt from Charlotte Brontë’s novel Jane Eyre, where the main character, Jane, speaks about the “germs of love,” which actually refers to the early stages of love. Here, Fitzgerald uses the synecdoche “Oxford man” during a conversation between Jordan and Tom. “Oxford man” is a term used to call a man who has attended the legendary English university. It also represents a certain level of class, wealth, and learning that is vital for a person to be considered as an elite member of society. In this poem, Eliot uses synecdoche to speak about the relationships with human beings as relationships with their parts, everything from one’s face, hands, voice, eyes, and arms. The use of synecdoche puts a spotlight on the narrator’s inability to form whole human relationships which have led to his insecurities and feelings of loneliness. While he may be familiar with their parts, he does not truly know any one of them. “The western wave was all a-flame. The “wave” represents the whole ocean (or at least a part of it that is larger than a wave). And when the Ancient Mariner of the poem says “the western wave,” he talks about the ocean to the west that extends to the western horizon. The interesting part about synecdoche is how it enables writers and speakers to transform day-to-day language into something more thought-provoking than usual. This is one of the reasons why it’s an all-time favorite in poetry and music lyrics. Synecdoche is a type of symbolism where one thing is used to represent something else. Drawing attention to the part instead of a whole allows us to be more specific with our point as well. Like how the “hands” is always used to do a job, and while the entire person is vital to the completion of a task, using the “hands” emphasizes the exact part that will be doing the work. You may also see antiphrasis examples. Synecdoche is also important for other reasons. Rather than listing all the people involved in a sports team or cast, synecdoche can help us achieve brevity. It even allows us to capture the essence of an idea as opposed to listing its every aspect. Giving an otherwise common idea or object a deeper meaning can help a writer draw a reader’s attention toward their actual message. And similar to any other literary device, when used appropriately, synecdoche adds a unique color to words, making them appear more vivid in the minds of an audience. After all, part of being a writer is the ability to add this “life” factor to a literary work by describing simple, everyday things creatively with the help of a literary device. You may also see synthesis essay examples. Synecdoche is a versatile literary device that writers can use in several ways. It offers us the ability to simplify a collection of parts by using it as whole, and highlight certain aspects of the whole by using its most vital parts. Many writers continue to use this figurative language for simplification and brevity, or poeticism and elaboration purposes. You may also see anaphora examples.